I am a life long spiritual seeker, exploring the mysteries of man, life, and the universe. I had several mystical experiences during my life. These experiences were often unexpected, and they lie outside what we have been told is possible. They taught me about the Greater Reality, that part of reality that is not talked about in school, government or corporation. Nevertheless, it is very real, and it is a part of being human on this planet. I have studied many doctrines and teachings, both esoteric and scientific. I have learned to see their common essence. Many people have spiritual, mystical or just unusual experiences they never talk about because of the many taboos this society has about certain subjects. However, when they encounter someone they see they can trust they open up. It is time now for people to talk openly, and not to fear ridicule. I see it as my task to write about all these subjects and experiences that can enrich your life. Exchanging ideas, opinions, beliefs and experiences will bring us together, and we will realize that we are not different from each other. It does not matter where you live on the earth, or what your cultural background is. If we pay attention to our humanness, then we can create a better world for all of us. 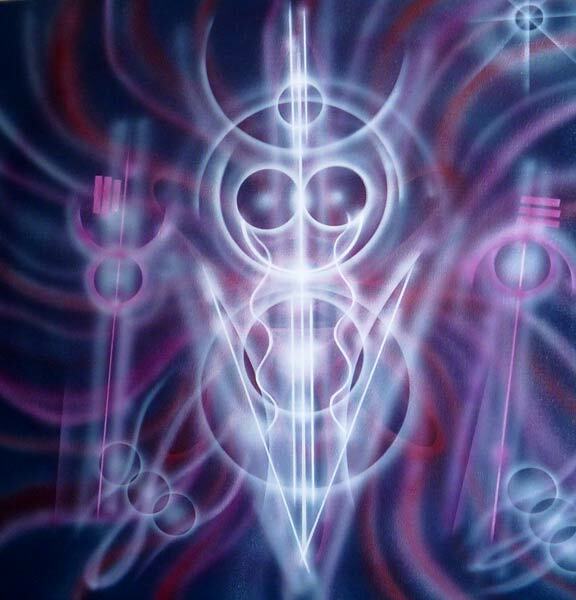 This is a painting of a cosmic light-sound being, painted by the Hungarian shaman Joska Soos. I bought it from him in 1989. You are very open. I follow a lot of blogs on WordPress but am writing your name down so I can make sure I read up on your experiences. Thank you for taking the time to voice, share, and question.